(Birmingham, AL) The Langum Charitable Trust announces that the first winner of its new biannual Gene E. & Adele R. Malott Prize for Recording Community Activism is Bruce Barcott for his book The Last Flight of the Scarlet Macaw: One Woman's Fight to Save the World's Most Beautiful Bird, published by Random House in 2008. The Langum Charitable Trust is a private operating foundation in Birmingham, Alabama that awards book and media prizes. Its other prizes are the David J. Langum, Sr. Prize in American Historical Fiction and the David J. Langum, Sr. Prize in American Legal History or Biography. The Malott Prize recognizes both significant grassroots activists and the authors, journalists, and film makers who cover them. However, the basis for the prize is for the quality of the writing or film. Eligible media include books, magazine articles, series of newspaper articles, or films. $1500 will be given to the author, and $1000 to the underlying project of community activism. "We are proud to announce Bruce Barcott as the winner of the first ever Malott prize as Barcott's book exemplifies the journalistic values which Gene and Adele Malott wanted to encourage and recognize. The book gives the reader a deeper understanding of the spirit of the activist, and the dedication it takes to fight for a cause, " says David J. Langum, Sr., founder of the Langum Trust. 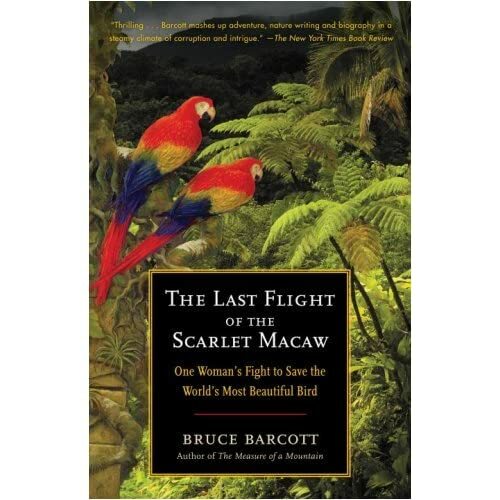 In The Last Flight of the Scarlet Macaw, Barcott tells the story of Sharon Matola who, while caring for orphaned animals at her own zoo in the tropical country of Belize, became one of Central America's greatest wildlife defenders. And when powerful outside forces conspired with the local government to build a dam that would flood the nesting ground of the last scarlet macaws in Belize, Matola was drawn into the fight of her life. The New York Times Book Review reviewed The Last Flight of the Scarlet Macaw, calling it "Thrilling . . . Barcott mashes up adventure, nature writing and biography in a steamy climate of corruption and intrigue." Bruce Barcott also wrote The Measure of a Mountain: Beauty and Terror on Mount Rainier, and is a contributing editor at Outside magazine. His feature articles have appeared in The New York Times Magazine, Mother Jones, Sports Illustrated, Harpers, Utne Reader, and other publications. He contributes reviews to The New York Times Book Review and the public radio show Living on Earth, and is a former Ted Scripps Fellow at the University of Colorado. He lives in Seattle with his wife and their two children. Thrilling . . . Barcott mashes up adventure, nature writing and biography in a steamy climate of corruption and intrigue. An absorbing narrative about an unheralded and faraway environmental battle that speaks volumes about the ways of our worldand how an individual might actually change it. This is a great read and an important story. This fascinating account . . . touches upon greed, corruption, and the legacy of colonialism. . . . Not even Hollywood could invent Sharon Matola [the] plucky American. This real page-turner of narrative nonfiction is hard to put down. "Partly Hiaasen-esque, but real life." With a plot so multilayered and dramatic that readers will need to remind themselves its a true account, the narrative achieves the depth of a case study and the accessible intimacy of a short feature. Barcott (The Measure of a Mountain) relates the dramatic and heart-rending story of one woman's struggle to save the scarlet macaw in the tiny country of Belize. Sharon Matola, an eccentric American who directs the Belize Zoo, learned in 1999 that a Canadian power company planned to build a dam that would destroy the habitat of the 200 scarlet macaws remaining in Belize. Helped by native Belizeans and the Natural Resources Defense Council, Matola mounted a six-year campaign against the dam, undaunted by government officials who branded her an enemy of the state and threatened to destroy her zoo by locating a new national garbage dump next to ita vindictive act halted only when Princess Anne of Great Britain, which gives Belize millions in aid, planned to speak out against it. But the combined forces of a determined corporation and a corrupt government were unrelenting, even after it was revealed that the power company's geological studies of the site were faulty and the dam could put human lives at stake. Barcott's compelling narrative is suspenseful right up to the last moment. (Feb. 12)Copyright © Reed Business Information, a division of Reed Elsevier Inc. All rights reserved. --This text refers to the Hardcover edition.